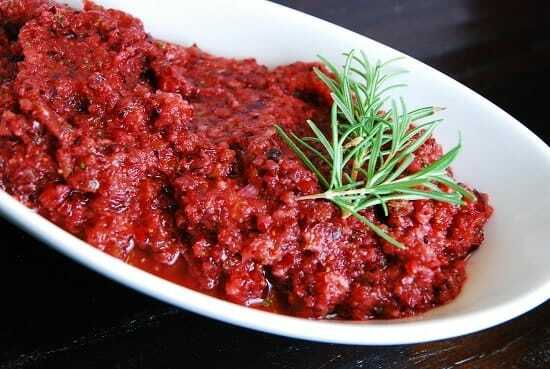 I first came across this amazing Cranberry Salsa Recipe at Crafty’s Cafe. Admittedly, I was a bit skeptical at first. But since I adore salsa, I was eager to give it a try. Plus, I thought it would make a really unique Thanksgiving appetizer recipe or Christmas appetizer recipe that would still be Weight Watchers friendly. It sure smelled good while I was making it, and when it was finally ready, I grabbed my favorite baked tortilla chips and dug in. OMG. It was SO good! I seriously could not stop eating it!! It was fresh and flavorful, and also a bit sweet and tart. My version uses lime juice instead of lemon, a bit less sugar and more fresh jalapenos. The flavor combinations worked out perfectly, and the cranberry salsa was a hit. While this makes a perfect festive holiday appetizer or snack, I’ll be making it as often as I can find fresh cranberries at the store. This was truly a fantastic dish and a must try. This easy and delicious holiday salsa recipe will knock your socks off! Tart, tangy, fresh and delicious, it makes the perfect Thanksgiving appetizer. In a food processor, chop the cranberries. In a medium sized bowl, combine the chopped cranberries and all other remaining ingredients. Cover, and refrigerate overnight, or at least 3 hours. This is my second year making this! My family loves it!!!! I was JUST craving this the other day….need to grab some cranberries! I made this last night to bring to a holiday party. I was excited to taste it and bring something unique but unfortunately I was disappointed. The cranberries, ginger, green onions, cilantro and jalapeño peppers are all ingredients I love, but mixed together in this recipe they just compete with each other and the flavor isn’t enjoyable. I brought it to the party anyway, hoping others might like it. It went uneaten. This was definitely unique! Unfortunately we didn’t care for the uniqueness. I’ll stick to salsa made with tomatoes. How long in advance of Thanksgiving (or whatever) do you think you could make this and have it still be good? I definitely want to give this a shot! I love that everyone is getting ready for the holidays!